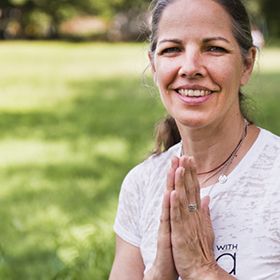 Nitya, the founder of Nitya Living™, has been an Integral Yoga teacher since 2005. She offers creative children’s Yoga programs with asanas, meditation, mindfulness practices, and breathing practices through storytelling and original songs. Nitya has published the Yoga with Nitya Kid’s Yoga DVD; the Satchidananda Ashram–Yogaville Coloring Book: A Child’s Journey into Yoga; Yoga with Nitya Cookbook: Seasonal, Local, Vegetarian Meals for a Healthy Family; and her latest Musings from Mat: Inspirations and Poetry.